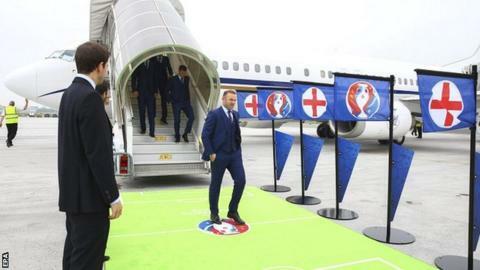 About 500 tickets for Euro 2016 matches have not been delivered to England fans because the Football Association failed to apply the right postage. The tickets, which account for 2% of the overall number bought through the FA, are being held at sorting offices. England's opener against Russia is on Saturday but the FA says it expects the tickets to arrive by Wednesday. Some fans on the England Supporters Club forum said they paid an extra £3.10 postage to collect their tickets. One supporter, David Stone, said he had already paid £6.95 for special delivery. "Incompetence of this level is pretty spectacular," he said. Another affected fan, Peter McCusker, 56, described the situation as "a bit of a shambles". The FA said that should fans have already made the journey to France, there will be a collection option at Marseille's Stade Velodrome, where the Group B match is taking place. "Following a despatching issue, a small number of match tickets are yet to reach England Supporters Travel Club members," it said. "We'd like to reassure supporters that this matter has been addressed and those yet to receive their tickets should expect to do so in the next 48 hours." Fan McCusker, from County Durham, said he was frustrated by the matter and said there had been a lack of communication from the FA. "If I'd known the tickets were in a sorting office near me I'd have gone to collect them myself," he said. "I hope they're better on the pitch than they are off it. We also booked tickets for another match, not involving England, through Uefa and had no problems at all."